Have you heard the news about threaded comments yet?? I first learned about it over at Jill’s Marvelous Mutliagers (be sure to check out her blog, she is so upbeat and inspiring!). This is a feature that should show up after you complete a couple of steps…you can see the basic steps in the article Jill links up here: Threaded Commenting!!! For some reason though, this is not working for everyone. So I peeked around a bit and found a wonderful and very easy-to-follow tutorial over at Simple Blogger Tutorials. It involves some HTML work, but is very easy to do. In case you’re a bit hesitant to go into the HTML of your blog, I made a little video to help you (hopefully) locate the code and to be sure your blog template isn’t altered accidentally. Would you like to try it? I hope it works out for you! The Patriots are in the playoffs tonight!!! Anyone else watching?!?! GO PATS!!! Yippee! I just stopped at the grocery store and it seemed like everyone in line was buying red and blue balloons with the one token mylar Patriots football-shaped balloon along with chips, and salsa! I used to work at a grocery store in high school and college and those playoff days were so fun–all the customers were in a good mood on those days! Interesting! I will have to check it out. Thanks for sharing the video! It is always easier to see it instead of just reading directions! Have a great 3 day weekend!!!! Thanks Kelly…I hope you have a wonderful weekend too! Thanks for posting about another great tutorial!! I just noticed it was on my blot this morning too! But now my comments aren't numbered anymore. aaargh, mine aren't either! I can't seem to get them renumbered now either!! Thanks for the tutorial! 🙂 My template must have been too detailed to make the switch on its own and I was able to use the link you suggested to get my threaded comments to show up! I just discovered this the other day on my blog and I love it! Thanks for posting so everyone knows! Kristen – you are covered in all kinds of awesome sauce!! I didn't click the "expand" box…I'm hoping that's the difference. I'm running out now to dinner but I can't wait to try it again! Big Bloggy Love to You! And ps..how do you feel about the friend connect gadget going away? I'm not gonna lie…I'm bummed. Thanks for the video!! I am such a visual person that this really helps me. Thanks. So does this reply go right to the person who left the comment? Or do they have to come back to your post and view the reply? Hey Erika, you still have to come back to see the replies, or subscribe to the thread to get it in an email. Help!!! 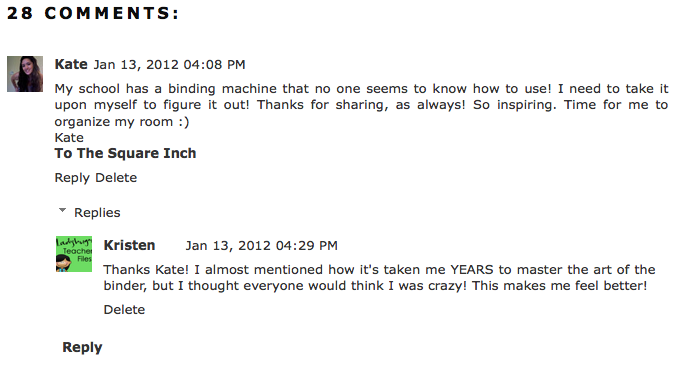 When I check my blog now using Chrome it takes me to my comments page. However, when I use Internet Explorer, it gives me a blank screen. Any thoughts. Hi Delighted! I think Internet Explorer has a hard time with these kind of features. I like to use Firefox. As long as you keep it updated, it doesn't seem to have a problem with items on our blogs. I hope this helps! Ok. I know this is probably right in front of my face…but how do I comment without having to hit "reply" on somebody else comment?! I mean is it so obvious and I'm just not seeing it?! ha! I just did this on firefox. Thanks for the headsup! Its great!! Oh thank you for your video and clear explanations! I think I got it! I just ran across this tutorial for numbering threaded comments. Don't know if it works because mine aren't threaded but thought you might like to try it. You seriously rock!!! Your tutorials are the best! This is fantastic – thanks so much for posting this! I just added this feature to my blog, and it was so easy! I'm excited to have this feature now! You are amazing! I've been trying to figure this out for awhile now and your tutorial did the trick. Thanks so much!